Thirsty Pilgrim: Drinkable, Edible Perfectionism on Rue du Lombard. Drinkable, Edible Perfectionism on Rue du Lombard. There are certain local watering holes I was keeping secret until the book came out, despite an overwhelming urge to shout a few of their names from the rooftops. 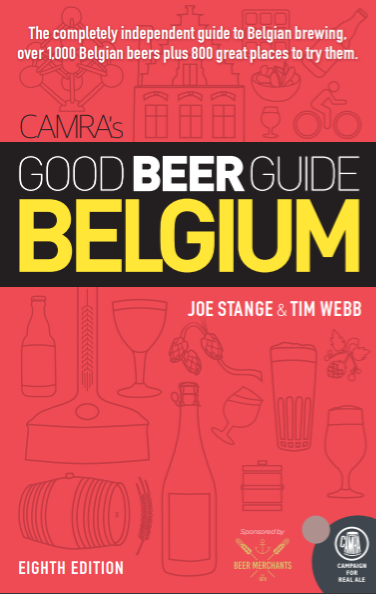 They are those gems previously unknown by beer geeks, tourist guidebooks, or even locals that (we hope) add real value to Around Brussels. Our hope was that giving them some attention would give them a well-deserved boost. At one of my true favorites — Nüetnigenough — there is at least anecdotal evidence of that happening. By the way: It's really tricky selecting 80 beers to go along with 80 separate places. After learning matrices in math class, I never thought I'd create one in real life. You've got to know what's available in all those places before you can recommend one for each, without conflict and preserving certain priorities. You make compromises. One of the smallest ones was picking Bons Voeux instead of my first choice, Saison Dupont, which was needed elsewhere. 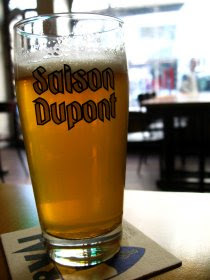 A handful of places in town (but never ever enough) offer Saison Dupont, but only a couple offer it on draft. This is enough to pull me in nearly every time I'm in the city center. Kegs of it appear occasionally at Belgophile beer cafés in the States, but unless you're a geek living here you won't know how rarely it's found on draft. Its classic incarnation is in corked, green 75 cL Champagne-style bottles, with brown 33cL ones occasionally seen. It is arguably more complex when bottle-conditioned, but on tap you find a fresher hop bitterness (and none of the skunkitude often found from the light-struck green bottles.) It's incredibly refreshing and I'm liable to put down a few glasses before remembering why I came downtown in the first place. The owners have plenty of working café experience and their goal was to offer the sort of place that they wished existed. (This reminds me of great brewers who make certain beers because they don't see anybody else making what they want to drink.) 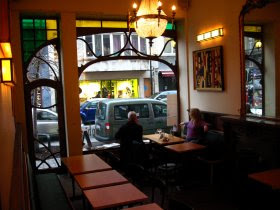 Its Art Nouveau facade hides a smoky interior, with long tables and sharp angles, that leans more toward Art Deco. A shortish but high-quality beer list (Cantillon, Dupont, Boon, Westmalle, Orval, and no corporate anything) is matched by a lean and muscular food menu. The tapas-influenced grub is tasty, affordable, and different from the brasserie norm. Frankly they deserve all the publicity they can get. And don't forget the rustic toilets! I could tell you like the place, as you made me visit both times I was in Brussels! :D Not that I was complaining, mind. The pork I had the second time was delicious, and the Saison Dupont always hits the right spot. You're making me thirsty, and it's only 9:30 AM here. Saison Dupont is good for breakfast, right? "Frankly they deserve all the publicity they can get." Consider it third-ed or fourth-ed. After you brought the wife and I there (and we all drooled @ Barry's pork - which if memory serves was not only really really tasty, but only 12-13 Euro), we somehow managed to visit again twice in our 18 hour stop in town on the way back to the states (dinner and, because a few hours later we were within 3 blocks and wanted more draft Dupont). Just awesome. Matt: I can confirm that Saison Dupont is good for breakfast.